lose your eyes and listen. It sounds like ping pong. But a quick glance tells you the players are not at a table but at what looks like a tennis court. Only, it’s smaller…. Valerie Fryczyaski, back to camera, volleys with Jackie Mahan at the new gym at Camp Caroline. What it is, is pickleball. 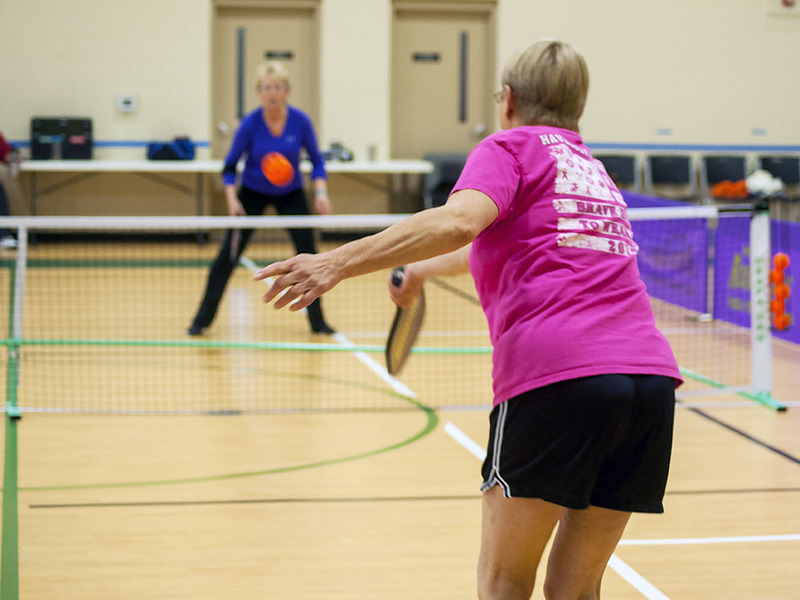 Said to be the fastest growing sport in America, pickleball got its start decades ago in a backyard outside Seattle. It’s now found a home in Oriental and Pamlico County, where 45 residents have joined the ranks in the past two years. Three games going on at once at the new gym at Camp Caroline a few miles outside Oriental. 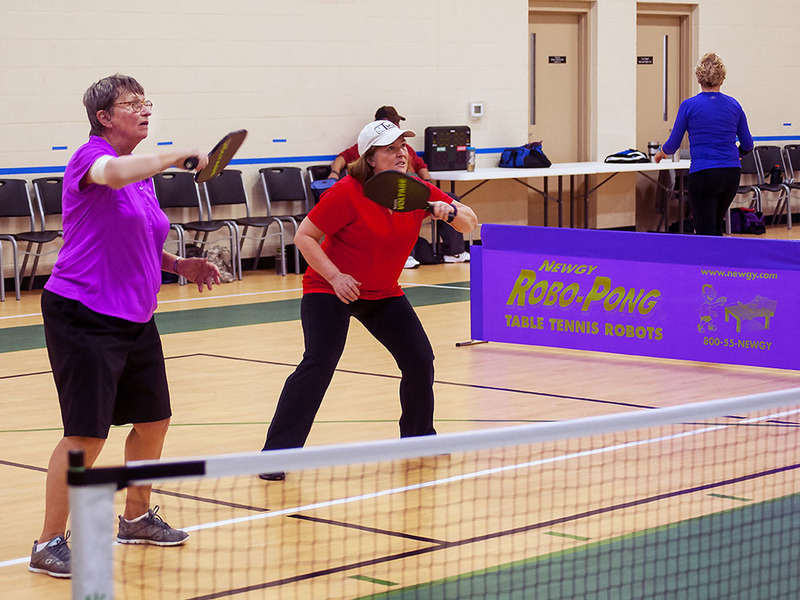 Ellen Polk puts quick reflexes to work on the pickleball court..
Driveway pickleball had been born in Pamlico County. So many now show up, mostly all the games are doubles. Deborah Bryant, left, and doubles partner Alice Petree. 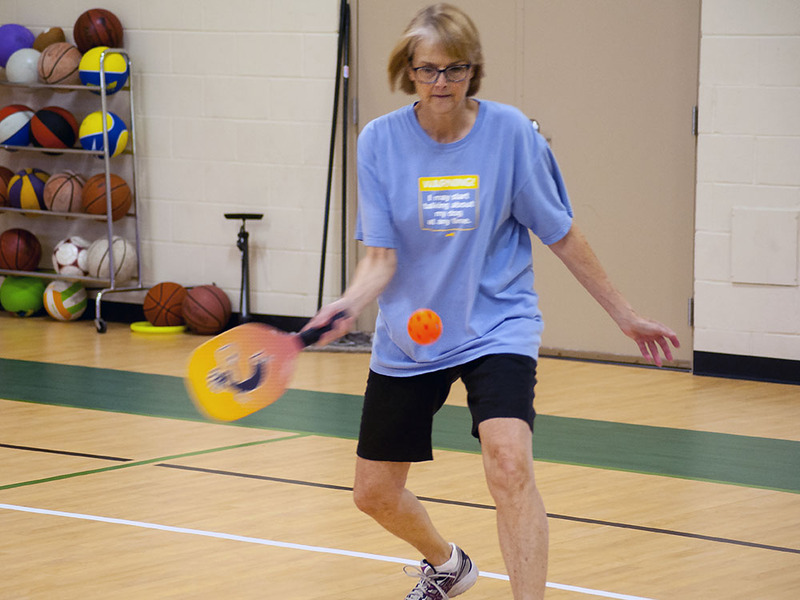 The first pickleball games in Pamlico County were played in Deborah Bryant’s driveway. More courts set up in the area that first year. Wyatt and Connis Cutler put one in their cul de sac; Oriental Plantation painted their tennis courts to accommodate pickleball. Arlington Place let Bill Gillespie tape their courts, and Bill also put in a court in his driveway. 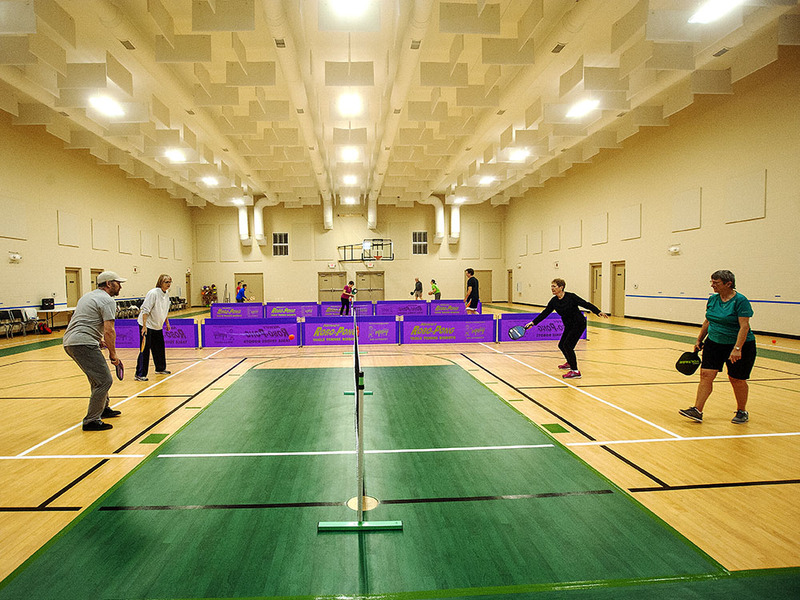 The Town of Oriental approved adding pickleball lines to the Lupton Park tennis courts over a year ago, That project is ‘still in the works’ according to Town Hall. 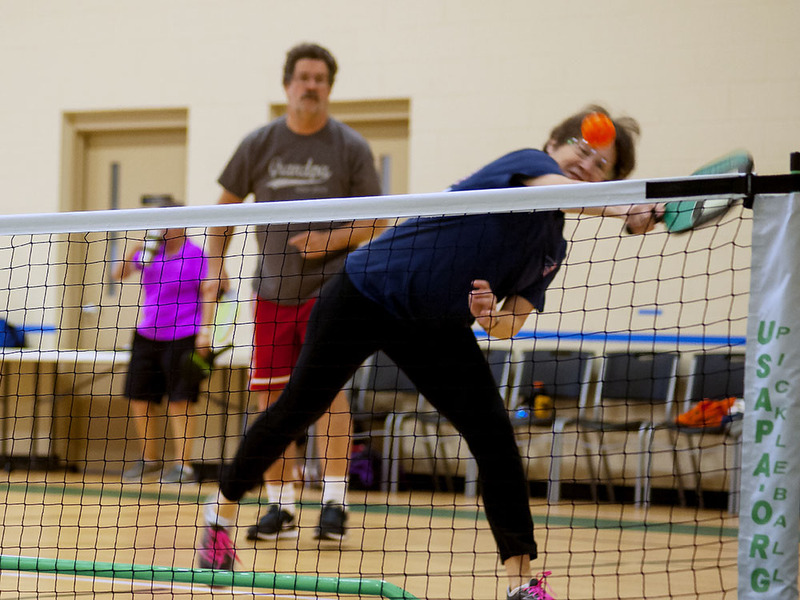 Susan Dillard calls pickleball “fun for anybody’s whole family,” She and other players say the game is way too much fun to characterize it as a sport for the highly intense athlete. Still, that doesn’t preclude playing with purpose. 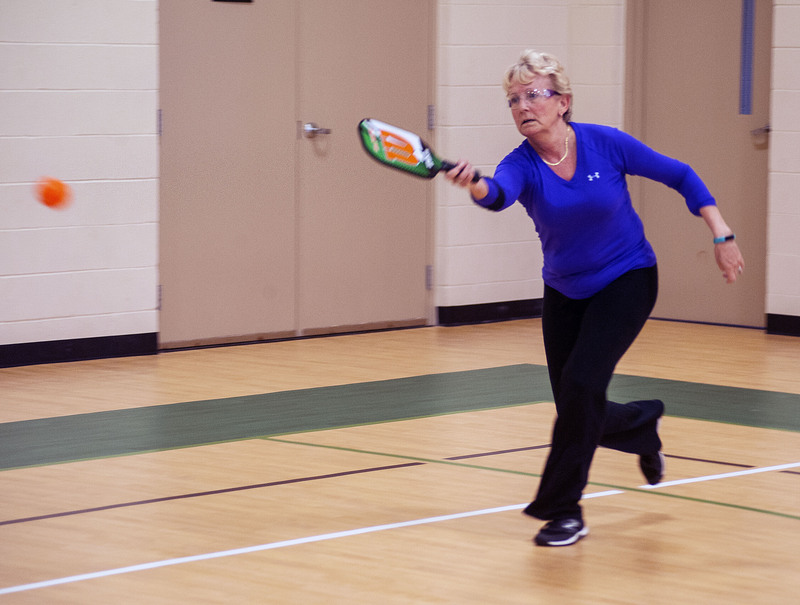 Just as pickleball is news to many people, the same could be said of the place where these players gather several times a week — in a brand new gym on the banks of Dawson’s Creek.